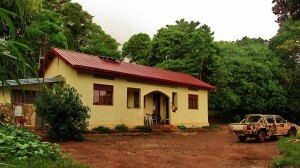 The Maranatha Gateway Vocational Centre is situated on the Ssese Islands in Lake Victoria, Uganda. 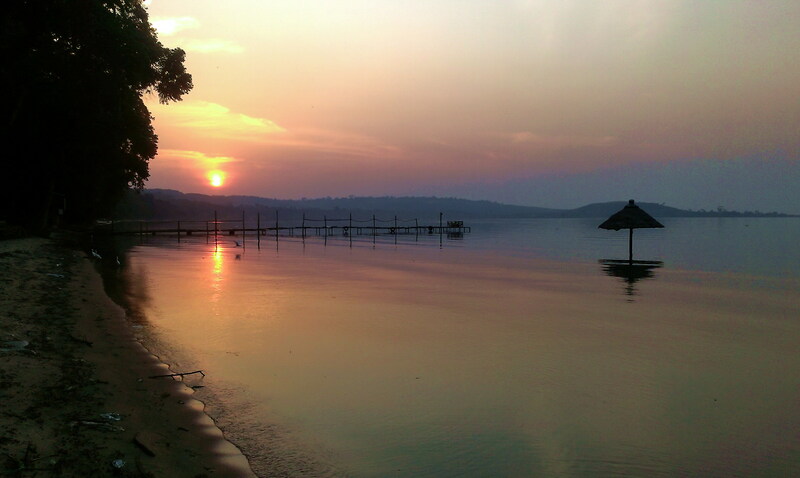 25 miles south of the Equator the Ssese Islands have a natural beauty that can take one’s breath away yet, mainly because of its geographical isolation from the rest of the country, this is also the poorest of all the Ugandan Districts. Alongside the tourist resorts on the north facing bay is one of the many abjectly poor villages of the islands, Lutoboka. Facing modern district offices in Kalangala Town are dilapidated shanties and shops. Again partially due to its isolation Kalangala District has the unenviable statistic of being the most prolific HIV/AIDS region in Uganda. 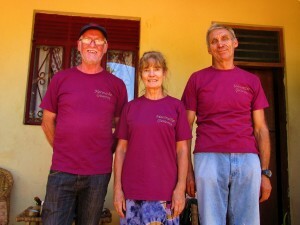 John and Sue Gasston first started to travel to East Africa nearly 20 years ago and have been developing and supporting many schemes over the years. However they were attracted particularly to Kalangala where they first linked to Bridge of Hope Primary School and then to a local church pastor, Fred Asiimwe. One thing that struck them was that in this region less than 40% of the islands’ children are able to go to school – not enough schools and not enough funding – which is half the percentage of children attending school nationally in Uganda. So what of the children who have had little or no education? 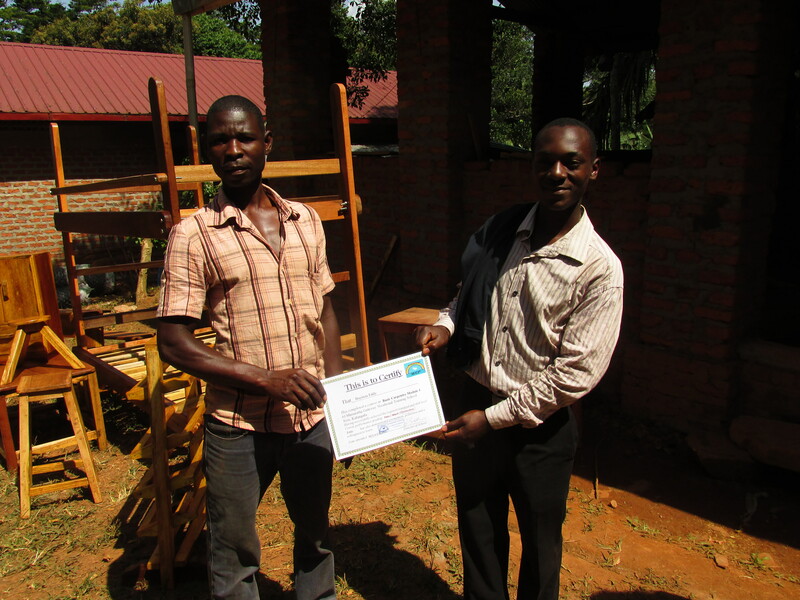 Maranatha Gateway Vocational Centre is now training young man and women in basic skills that will allow them to be able to earn a living. 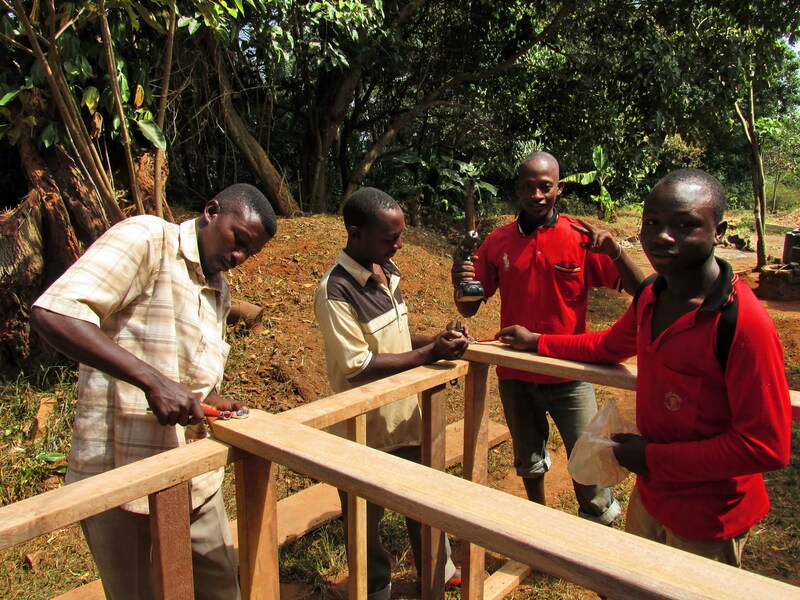 We have surprised local officials by training our students to craft well-made products during short modular courses rather than one or two years away at technical college (not they could attend these without previous school qualifications). We have been visited by the Hon Fred Badda MP, Cllr Willy Lugolobi (Chairman of the Kalangala District Council), reporters from Radio Ssese and the national press and visitors from the Ugandan mainland, Canada, Scandanavia, Germany, Poland, Belgium, Kenya and the UK. Our three basic course subjects are Carpentry, Bricklaying and Craft-making. Here you can see two of our craft students. These products are then taken to the resorts and sold to tourists – the girls earn any money in excess of the cost of the materials. 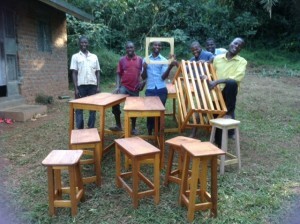 These stools, tables and other items were just a few of the pieces of furniture made on one of our short courses. Each of our students receives certification at the end of their course detailing all subjects covered and any distinctions awarded. Here is Mike Norbury with Sue and John outside the Administration Block at Maranatha Gateway. Having first visited Uganda in 2012 Mike joined the resident team in Kalangala for almost two years. He has now returned to Wrexham where he is responsible for marketing Equipe.